How do I give my payers the ability to change the day of their recurring plan themselves? Payers can manage their recurring plans within the Payer Portal. In the frequency section of the payment form a payer has checked out on, if you've set the recurring day option to "Decided at Checkout" or if you've set all options to "Decided at Checkout", you can give the payer the ability to change their recurring day in the Payer Portal. 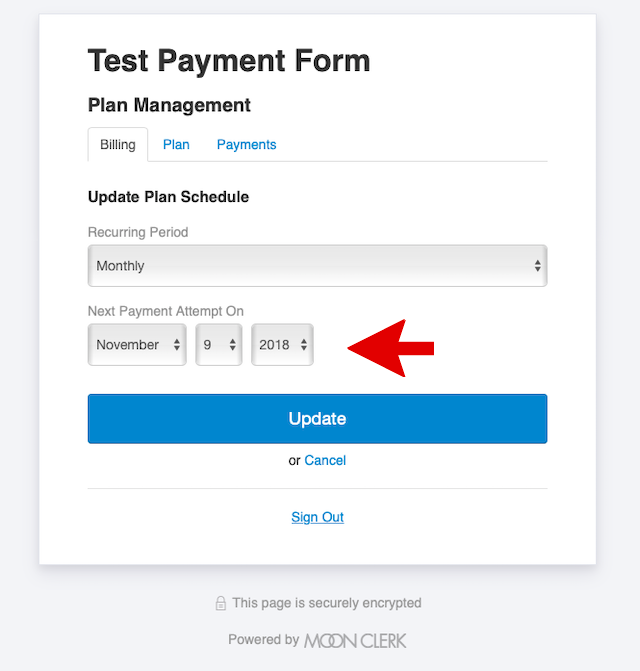 5) Now, when your payers go to their Payer Portal, they will be able to update the Next Payment Attempt (their recurring day) of their recurring plan, assuming the settings on the form they checked out on allow them to do so.